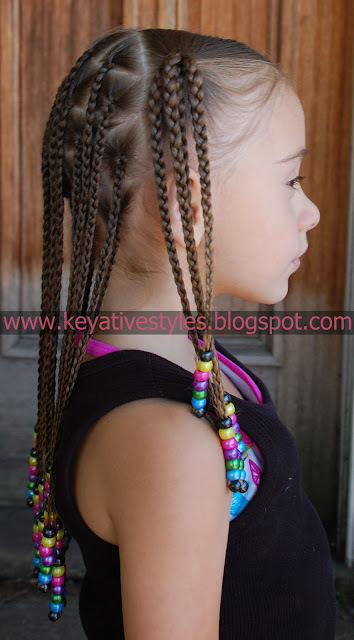 Since I haven’t been doing much with Keyanna’s hair lately I’m going to be posting some of our older styles that we have done. This one we did in the summer of 2010. Pretty simple.. Just 2 front pigtails with hanging braids, and then box braids in the back. 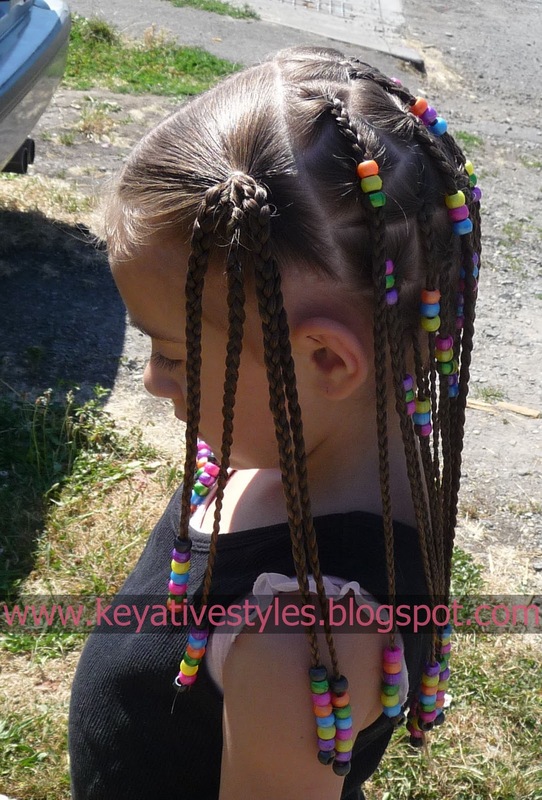 I used some really cheap rubber bands that I had bought at Walmart, and with the product we used in her hair + a day in the water at the splash pad.. The style only lasted a few hours before all the bands started breaking and beads were falling out. So on the way home that day I stopped by Sally’s Beauty and picked up some new bands, Proclaim brand. 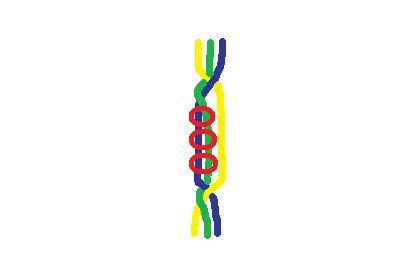 These are by far the best rubber bands that we have found and the only ones we use now. 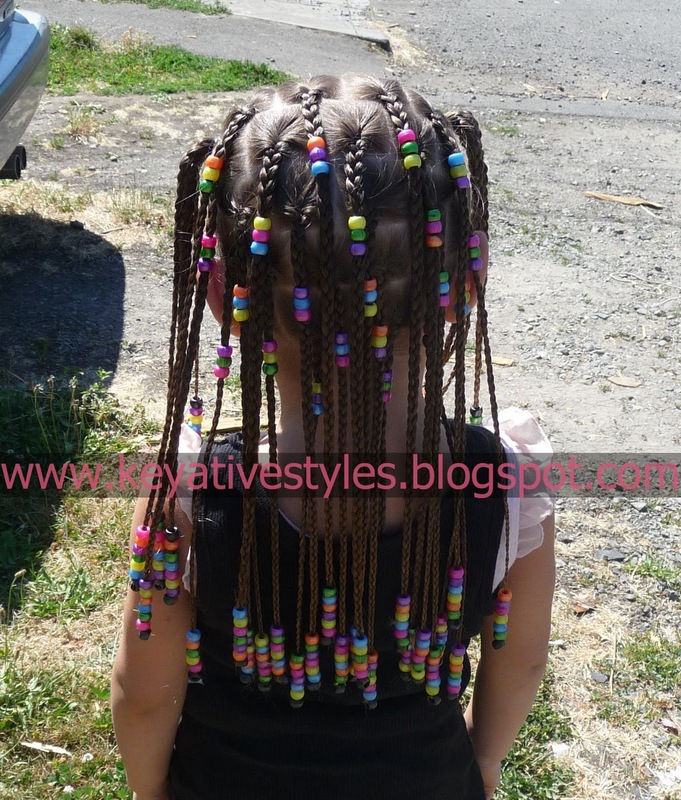 The next day when I was fixing up her hair I decided to add some extra beads towards the top of the braids. 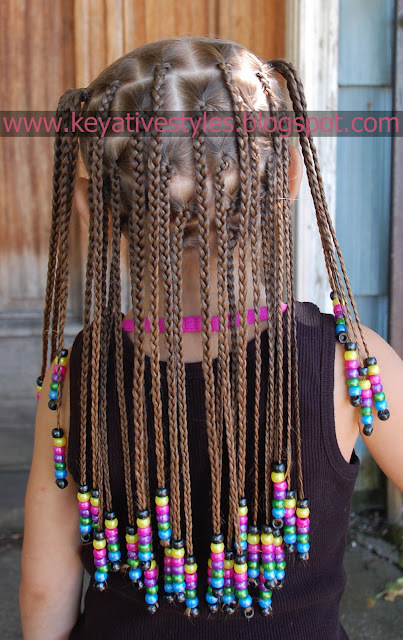 I did this by braiding her hair down an inch or 2, then using my beader I added the beads to 2 of the 3 strands of the hair I used for the braid. I then just continued braiding down. I did this style way before I started the blog so I really don’t have any tutorials but I tried to do an illustration to give you all a visual of how I did it (try not to laugh, I’m no artist) Lol. Very pretty! The drawing isn't bad lol, it gets the point across! I love the floating beads look! Very different. Love the style, very cool!! This is super cute!! I might have to try this!